A vicious ghost rider, the Katawa- guruma. This yokai follows the same motif as the waynudo, in that they are humans whose vices punished them into being spirits affixed to a fiery wheel that immolates anyone who crosses their paths. However, unlike the Waynudo, which is a disgraced monk whose head is fixed into a wheel, the Katawa guruma is a disgraced woman whose full body is attached to a wheel. Even though she is often merciless, she is capable of mercy. Like the Waynudo, she is a being full of intense wrath and any news of her approaching a town is met with citizens locking themselves up and refraining from looking upon her, as it will incur her wrath. She has the exact same story as the Waynudo in that a woman stopped to see the Katawa guruma resulted in her son getting burned and run over by the Katawa guruma, chiding the woman for losing sight of her son while looking at her. However, when the woman showed remorse for her actions, the Katawa-guruma returned the child, unharmed and left the village. My depiction of the Katawa guruma is to keep the metallic look like the Waynudo, except as a full metallic body. 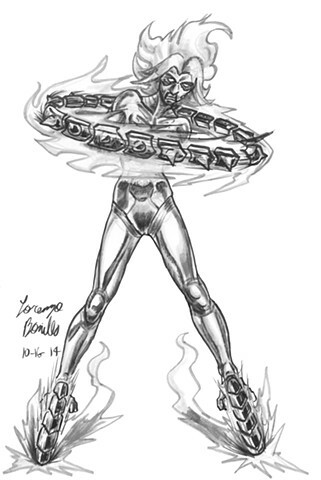 The story depicts riding one wheel, but I had her have her feet become wheels and her torso having a perpetually spinning wheel of fire around her torso. The design of the wheels also are modeled after the Waynudo. I also made her hair pure fire and made her mouth and abdomen house vents to spew forth extreme steam.